Time: 10 AM — 2 PM. How much do you LOVE hiking, snowshoeing, and cross country skiing? Show your love for the best outdoor Winter sports on the North Country Trail and the Giant Pines Loop and take in views of the Upper Falls at Tahquamenon Falls State Park. Morning hike is at 10am (starting at the Upper Falls parking lot) and is a looped hike that includes the Upper Falls and the Giant Pines Loop that the NCT overlays for quite a while. There is an option to follow the NCT off the loop to view the 500' beaver dam and new boardwalk built in 2017 just off the loop. The loop is about 4 miles long and is groomed for skiing. 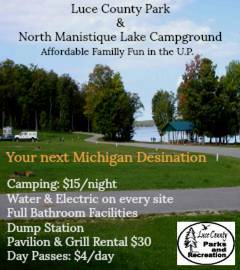 After that we will lunch at the Camp 33 Tahquamenon Brewery located there by the parking lot. After Lunch there will be an option to cover some of the other trails in the park! At 6pm the lantern lit trail at the Upper Falls will be available for a night time hike. The Park will have snowshoes and hot cocoa available at the Fact Shack. A Michigan Recreation Passport is required for entry. Purchase your Recreation Passport at the park entrance or at the Secretary of State when you renew your vehicle tabs. Bring: Water, Skis or snowshoes, camera, clothing for hiking and fresh clothing for in between, water AND a FRIEND! Questions? Comments? Post them here or call Tom at 906-440-0831. Cell phone service is spotty at the park so there may not be an answer the day of the event.